Death, Taxes, Lawsuits, Illness and Identity Theft – Get Ready To Protect Yourself, Your Business and Your Future. Supreme Court Counselor, Asset Protection Specialist, Estate Planning Attorney, National Speaker, and Renowned Author, Lee R. Phillips teaches you how to safe-guard your assets, keep more of what you earn, pass your wealth flawlessly to your heirs and develop a foolproof plan for your future! Outlines important Asset Protection Strategies. Shows you how to make money and protect assets using small business structures. Includes the Benefit & Retirement Saving Plan System. What probate is, how long might it last, and how much it could cost you. Common ways people try to avoid probate, and why most of them are just BAD IDEAS! How to avoid probate the CORRECT WAY! When to actually use probate to your advantage (but only if you decide to). The tax consequences of joint ownership. Don’t put yourself in jeopardy with the IRS by making huge mistakes. How to ‘undo’ your past bad decisions of joint ownership. Why you should NEVER put anyone else’s name on your property, maybe NOT EVEN YOUR OWN SPOUSE. How to certify your Will so it is legal in all 50 states. Make your Will “self-proving,” so it can’t be challenged after you die. The advantages and disadvantages of a Holographic Will. Learn the common misconceptions of Wills and probate. Revocable Living Trusts (also called Family Trusts or Inter Vivos Trusts). Why 90% of Revocable Living Trusts out there DON’T avoid probate, even though the lawyers said they would. How to create and use my “iron-clad” trust documents that absolutely will avoid probate. The proper way to name your trust. Do this wrong and you could be setting yourself up for problems. How to structure your trust to properly handle a remarriage after your spouse dies. Don’t let the new Black Widow spouse end up with everything (leaving your kids without a dime!). Who must you “file” your trust with? The phrases you need in your Trust so the Bank will immediately deal with your heirs. What powers should you give your Trustees? The paragraph your trust needs to prevent your beneficiaries’ shares from being attacked in lawsuits. How to use an A-B trust provision to make sure both you and your spouse’s deduction are recognized by the IRS. Give your family over $700,000 extra dollars or get an extra $700,000 from mom and dad. What is a Fraudulent Conveyance? Structure your paper-trail so predatory creditors will have a difficult time getting your assets. Designate your property ownership the “right way”, so your assets are shielded from professional liability. What is “deferred liability” and why you should be concerned? Business and personal structures to go right out and around legal problems. How to pass your business on to your heirs. Find out the correct Business Entity for you… set it up… and begin using it CORRECTLY. Discover why over half the population may be unintentionally running a General Partnership, and the HUGE risks associated with them. Do you really need a Nevada or Delaware Corporation? Find out if the extra $1000 cost and work is necessary from the perspective of a litigation attorney. Discover the extra benefits of Limited Liability Partnerships and Limited Liability Companies (LLP and LLC), and why Litigation Attorneys may shy away from suing one. Why the majority of business owners end up being personally liable, even though they were sure they were protected…Avoid these pitfalls to protect yourself. What are the weaknesses of Family Limited Partnerships? When should you really use them? Identity Theft Protection (limited time Bonus). How does the identity thief find you, and how do you shield yourself? Simple things you may be doing every day that put your identity at risk. How to clean up the mess if you are stung by identity theft. Step-by-step instructions. Let us guide you step-by-step on how to prepare your Revocable Living Trust, Durable Power of Attorney, Last Will, and Living Will. These 10 audio CDs and 218 page workbook show you where you need to edit forms to make them work for your specific situation. They are not just fill-in-the-blank forms. A simple fill in the blank form is no good to you. These forms will be adapted to your needs.Don’t worry, you can do it. It’s easy when you have the Accumulation and Preservation of Wealth System. Revocable Living Trust – A variety of trust templates to choose which works best for your situation. The audio CDs give you little known techniques to let you protect assets and plan to stop black widows after either you or your spouse dies. The Qualified Terminable Interest Property Trust (QTIP Trust) is included for limiting the distribution of assets by the surviving spouse and addressing the black widow issues. Last Will and Testament – Whether you decide to just create a will without creating a trust, or if you are integrating a will with a Living Revocable Trust, a will is essential to your estate planning goals even if you have a trust. Living Will – Make sure the medical community understands your real wishes when it comes to keeping your body alive when your brain is not. Durable Power of Attorney – Make sure someone has the authority to take care of your personal matters if you become incapacitated. You have a 500 percent bigger chance of being incompetent or incapacitated next week than you do being dead. Life Insurance Trust – Remove your life insurance from the IRS reach with this irrevocable life insurance trust. Yes, your life insurance is taxable, even though your agent may have said it wasn’t. People routinely lose half of their life insurance to the IRS. Save potentially hundreds of thousands in taxes. Guides you through creating and maintaining the appropriate business structures, including making decisions on whether to use a corporation, limited liability company, limited family partnership, etc. I teach you to use these structures properly to legally shield your assets and plan for maximum tax savings. Your business is your most important tax shelter. You will be able to make an extra $10,000 plus this year. Corporation documents (Both C and S Corporations), including Articles of Incorporation, Bylaws, Waiver of Notices, Minutes of Organizational Meeting, Minutes of a Special Meeting Documents for simple Section 105 employee benefit plans, and an extensive 38 point checklist for making your Corporation hold up in court. Limited Liability Company documents, including Articles of Organization, Operating Agreement, Purchaser’s Membership Interest Certificate, and special 27 point checklist of Items to Review for ensuring your LLC’s limited liability will hold up in court.. The LLC is your most flexible business tool today. General Partnership, includes a full agreement. Sixty percent of the population is in a General Partnership. You don’t want the liability of being in a General Partnership, but if you are going to be in one, use this document and define what you are doing. Learn how to tell if you are in a partnership already – you probably don’t even know you’re in one. Over half of the population is in a general partnership, and they don’t know it. They are hanging out fully exposed. Where is the attack coming from? Do what you can to protect yourself now. Family Limited Partnership, includes agreement and Certificate of Limited Partnership Interests. This is a business tool for the family. It gives great asset protection, tax advantages and estate planning advantages. Independent Contractor’s Agreement, includes several examples of the agreements. Read them and use the one that best fits your situation. Without the document, you may think you are hiring the guy as an independent, but when there is a law suit, the presumption of law is he is your employee. Real Estate Lease includes the kitchen-sink business lease. It has everything including the kitchen sink. Take out the parts you don’t like, and you’ve got your lease left. Equipment Lease gives you a written lease template to use right away. Renting equipment to your own business is a neat asset protection tool and tax planning tool. You have to use the LLC or FLP, but it works if you set things up properly with a written lease. You may be familiar with the 401(k) as a retirement planning tool. What you don’t know is you can have a 401(k) that you establish yourself. You don’t have to have a broker, banker, insurance dude, or anyone else establish the plan for you and hold your money. A 401(k) isn’t like an IRA. You don’t have to have an independent IRA approved trustee. The 401(k) is governed by the 401(k) trust agreement, and you can be the trustee. All you have to do is have the paper work – the plan documents.The Flexible Benefits & Retirement Saving Plans System gives you the plan documents. Additionally, it has all of the plan documents for the new HRA plans. Make all of your “health related” expenses TAX FREE, and put away tax deductible dollars today for your future health expenses.The CDs explain exactly what you need to do. That will effectively give you an extra $5,000 or more in spending money each year. Learn to save thousands in taxes while putting away money for your own retirement and health related expenses. Package includes almost 3 audio CDs and two binders of workbooks with complete samples. All the plan documents are on a computer CD. Health Reimbursement Agreement (HRA), includes plan documents and summary plan documents for employee distribution. This law can easily give you an extra $5,000 a year out of your little company. It gives you a full tax deduction for money moved from your company into the plan – how much? NO limit! It makes all of your “health related” expenses tax free.There’s no “use it or lose it” rule. This one is cool. NO independent administrator required. Health Savings Account (HAS), includes plan documents and summary plan documents. If your company already has one, your insurance guy sold it to you.It lacks a lot of the benefits of the HRA, but use it. It is cool. The audio will give you all of the advantages and disadvantages. Learn how to use the one you’ve got. 125 Plans (also called Flex Plans or Cafeteria Plans), includes plan documents and plan summary documents, charts and trusts for administration. This is the plan that lets you do all of the medical, child care and other expenses tax free. The audio instructions lead you through the 5500 forms, discrimination testing and everything else. 401(k), includes plan documents, summary plan documents, 401(k) Trust Agreement, and shows you how to make your retirement fund grow fast.You don’t need your broker or insurance dude. You can be the trustee, put your money away, get a tax deduction, invest it basically anywhere you want, and make it grow tax deferred. This will let you get ahead financially a whole lot faster! Group Wrap Plan, includes documents and explanation to wrap your benefits up in one package to be able to make changes easily without having to go through each individual document every time a provider, the insurer, or the government decide to change the rules. SAR Simplified Employee Pension includes summary, plan documents, and discussion. IRA information included within the structure of each other appropriate plan, with forms and documentation needed. Over $25,000 in legal materials in included in the three sets! 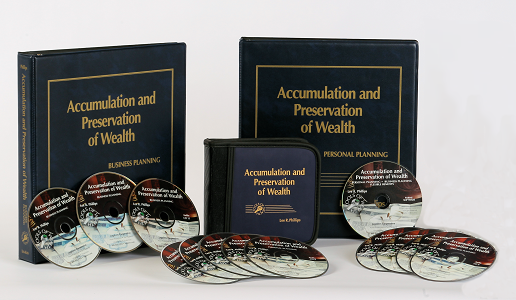 And all the instructions to show you how to make money and protect your assets using each document. A bare bones estate plan and asset protection structure of this quality will cost over $10,000+ using one of the big down town law firms. This isn’t something only you need to do. Your whole family needs to do this work. The Accumulation and Preservation of Wealth System is copyrighted, but it comes with a special license to let you use it for your whole family. Using the full Accumulation and Preservation of Wealth System, you will have a better estate plan and better asset protection in place, because you’ll actually understand it (and understand what it will take to actually make the document make more money for you and protect your assets). *Passing your estate down to your heirs– without a lot of legal expenses. These are the little-known personal protection techniques used by top attorneys. The Accumulation and Preservation of Wealth System provides everything you need to make sure you get a good Living Trust that does what YOU want it to. I have helped thousands of people get what they want. I have put together for you the full set of documents used in my own office. If you would like to learn to create an asset protection plan for YOURSELF… without spending a bunch on an expensive attorney …. then this will be the most important system you will ever acquire. Let me share a secret with you: The KEY to asset protection is understanding exactly what you are doing. The biggest mistake you can make is relying on someone to ‘take care of it’ for you. You need to understand exactly the trade-offs involved in each of the different techniques. The Accumulation and Preservation of Wealth System has been used successfully by tens of thousands of people to preserve their wealth using the System’s powerful legal documents. Whether your goals are to pass your assets to your children without the long probate process, or to protect your property from financial tragedies, the Accumulation and Preservation of Wealth System can save you thousands of dollars, even if you use your own attorney, because the System shows you how to pick attorneys and bargain with them. Plus, you will know what you want and get in and out of the attorney’s office fast. You can do it yourself or use the attorneys – not be used by them. And in fact, you’ll end up with a much better estate plan and asset protection plan than you’ll get by just walking in and blindly saying, “Here I am Mr. Attorney. Set me up!” If you do that, you’ll get what you just asked for – a set up. The fact of the matter is, nobody will care more about correctly establishing your estate and asset protection plan than YOU! So why take any chances? But Will These Strategies Work In My State? In the Accumulation and Preservation of Wealth System CD audio instructions, I tell you where to look for the differences in your state. You could keep putting off this important legal work that EVERYONE needs to get done, or you can get the best proven asset protection system on the market today for a fraction of the cost of hiring an attorney, and you’ll end up with a better plan, because you’ll UNDERSTAND IT. P.S. What about a Money Back Guarantee? I’m so positive that you’ll find the information in your Accumulation and Preservation of Wealth System valuable, that I back it up with a 30 day “No Hassle” Money Back Guarantee on the Product. Just return the system in good condition and I’ll be happy to refund your purchase price less credit card fees and shipping costs. LIMITED TIME OFFER: You will be given special instructions for contacting LegaLees Corporation free of charge (for up to 5 hours) to have any questions answered regarding your Accumulation and Preservation of Wealth System legal documents. You’ll get personal answers from attorneys about any questions you have about the information in the Accumulation and Preservation of Wealth System! All orders are shipped UPS within 2 business days! Most orders should arrive within 5 to 7 business days. Your BONUS down loadable e-book will be available by the next business day.